Firearms, Ammo, and More! 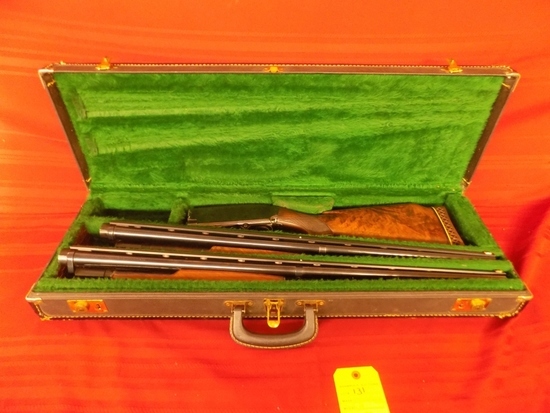 February 9th, 2019 9:30am Located @ Shamrock Auction Gallery 10396 SR 6, Laceyville, PA 18623 Winchester, Marlin, Colt, Smith & Wesson, Steyr and more. Payment Instructions: We accept credit cards Visa, Mastercard Only. Credit Card on file will be charged post auction. No sales tax will be charged for any items shipped out of Pa. You will receive 2 invoices for this auction, one for your purchases and a final complete invoice with shipping and handling charges. Preview Date & Times: day of auction 2 hours prior. Checkout Date & Times: Pickup times and dates: day following sale. Driving Directions: Located at 10396 SR 6, Laceyville, PA 18623. Mile Marker 300 Rt 6 West. ALL Firearms BUYERS: You will need to fax or email a copy of your local FFL dealers license to our office within 48 hours of a winning bid. Your must include: your name, phone number and bidder number. Fax all information to 570-869-1859 or email to Auctions@BurkesGunShop.com, contact Burke's Gun Shop at 570-869-1119 for any additional information prior to bidding. You must be 18 years old or older to register for this auction. Brian Burke Auctions/Burke's Gun Shop LLC has not fired any firearm in this auction. As such we cannot and do not warranty these items. You should have all guns inspected for safety prior to using them. NO REFUNDS. No international shipping on firearms. Brian Burke Auctions is providing Internet pre-auction and live bidding as a service to Bidders. Bidder acknowledges and understands that this service may or may not function correctly the day of the auction. Under no circumstances shall Bidder have any kind of claim against Brian Burke Auctions or anyone else if the Internet service fails to work correctly before or during the live auction. Shamrock Auction Services LLC will not be responsible for any missed bids from any source. Internet bidders who desire to make certain their bid is acknowledged should use the proxy-bidding feature and leave their maximum bid 24 hours before the auction begins. Brian Burke Auctions reserves the right to withdraw or re-catalog items in this auction. All property is sold AS IS with all faults and blemishes, and ALL SALES ARE FINAL. Property is open to thorough public inspection. It is the Bidders responsibility to determine condition, age, genuineness, value or any other determinative factor. Brian Burke Auctions and/or Burke's Gun Shop LLC may attempt to describe the merchandise in advertising, on the Internet and at the auction but makes no representations. In no event shall Brian Burke Auctions and/or Burke's Gun Shop LLC be held responsible for having made or implied any warranty of merchantability or fitness for a particular purpose. Bidder shall be the sole judge of value. Bidders who bid from off site and are not present at the live auction or preview understand and acknowledge that they may not be able to inspect an item as well as if they examined it in person. Brian Burke Auctions/Burke's Gun Shop LLC endeavors to describe each item. Brian Burke Auctions/Burke's Gun Shop LLC will not be responsible for errors in descriptions. Brian Burke Auctions/Burke's Gun Shop LLC will not guarantee grades or authenticity on coins. All grading questions should be addressed prior to sale time. We will be happy to email other pictures to you, if needed. All sales final. ******** SPECIAL FIREARMS SHIPPING TERMS: All Federal firearms laws will be complied with. Background checks will be conducted on ALL firearm purchases. Firearms must be paid for before a background check. Failure to pass the background check will result in the buyer consigning the item to an upcoming Auction. Any out of state firearm purchases must be shipped to an FFL dealer in your area. The buyer is responsible for actual shipping plus a $15 handling fee per firearm. This will be determined by the shipper. Some firearms may not be legal in all locations. Know your local laws before you bid. NO REFUNDS. Brian Burke Auctions/Burke's Gun Shop LLC has not fired any firearm in this auction. As such we cannot and do not warranty these items. You should have all guns inspected for safety prior to using them. NO REFUNDS. No international shipping on firearms. On-line Bidding Terms: 1. Brian Burke Auctions/Burke's GUn Shop LLC has put forth every effort in preparing the catalog for this auction to provide accurate descriptions of all items. All property is sold 'as-is' and it is the bidder’s responsibility to determine the exact condition of each item. Printed statements or descriptions by staff are provided in good faith and are matters of opinion. Absolutely NO refunds will be offered. 2. FOR ONLINE BIDDING: There is a 18% Buyer's Premium added to your total purchase. 3. All accounts must be settled at the conclusion of the auction. We accept Visa & MasterCard ONLY. NO CHECKS FROM ONLINE BIDDERS! 4. The auction company through UPS/FedEx/USPS and will arrange packing/handling and shipping. Packing and shipping costs are the responsibility of the buyer. All items will be insured for the purchase price. Our first priority is to deliver your new purchase in excellent condition. We charge actual shipping plus a $10 fee per box for handling. 5. Our on-line auctions move quickly! If you are interested in an item, bid quickly. If you win an item in the auction you will be notified by email the next business day. All items will be charged to the credit card on file. Any bidders with credit cards that are declined on reconciliation day will be charged a $30 processing fee to run another credit card- NO EXCEPTIONS! 6. In order to better serve our customers, all bidders must provide their name, address, daytime phone number, and email address at which they can be contacted. This is to insure good communication between Shamrock Auction Service and the bidder throughout any transactions. 7. The purchaser agrees to pay all reasonable attorney fees and costs incurred by the auction company in the collection of funds. The purchaser also agrees that a fee of 2% per month will be added to the balance of any unpaid balance due the auction company and any other costs or losses incurred by the purchasers failure to adhere to these terms. Any and all disputes that arise under terms of this contract are to be submitted to arbitration in county of our residence. Wyoming County, Pennsylvania. 8. The auctioneer has the sole discretion to advance the bidding and may reject a nominal advance, should it in his estimation prove injurious to the auction. The auctioneer shall be the final judge in all bidding disputes and shall name a bidder as the purchaser. 9. The auction company shall not be held responsible for any 'missed' bids or bids unseen by the auctioneer. The auctioneer reserves the right to reopen a tied bid between the tied bidders and no one else. 10. All sales are final. 11. By bidding on any item, the bidder shows acceptance of the terms of the auction. 12. The auction company reserves the right to refuse service or decline registration to any person. 13. SPECIAL FIREARMS SHIPPING TERMS:All Federal firearms laws will be complied with. Background checks will be conducted on ALL firearm purchases. Firearms must be paid for before a background check. Failure to pass the background check will result in the buyer consigning the item to an upcoming Auction. Any out of state firearm purchases must be shipped to an FFL dealer in your area. The buyer is responsible for actual shipping plus a $15 handling fee per firearm. Some firearms may not be legal in all locations. Know your local laws before you bid. NO REFUNDS. Brian Burke Auctions/Burke's Gun Shop LLC has not fired any firearm in this auction. As such we cannot and do not warranty these items. You should have all guns inspected for safety prior to using them. ALL BUYERS: You will need to fax or email a copy of your local FFL dealers license to our office within 48 hours of a winning bid. Your must include: your name, phone number and bidder number. Fax all information to 570-869-1859 or email to burkesgunshop@frontier.com, contact Burke's Gun Shop at 570-869-1119 for any additional information prior to bidding. 3 vintage boxes of western 40-70. 49rds total. ProChrono plus Chronograph. appears complete.